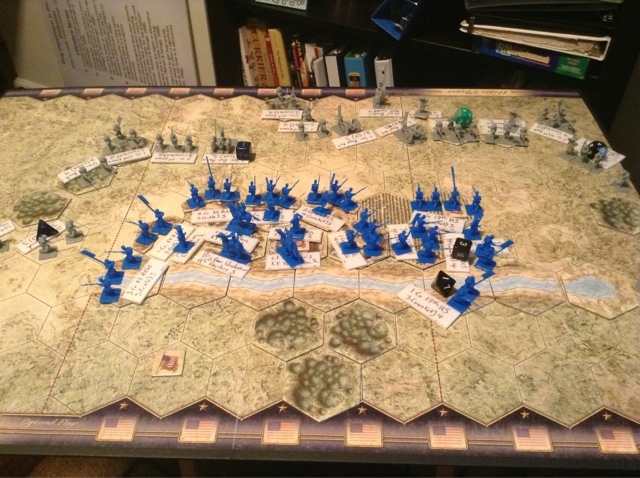 I've spent some time this week working on a set of variant rules for the American Civil War board game Battlecry! 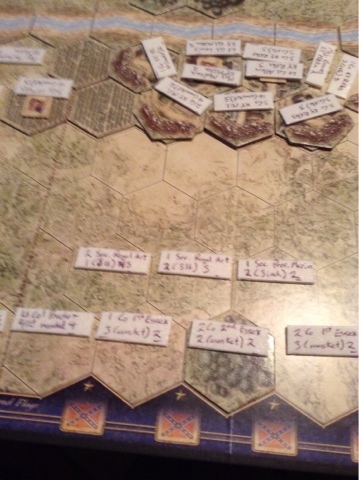 Using the Confederates as stand ins for the British and Indians, I've started playtesting by simulating the Second Battle of Frenchtown, which took place 200 years ago this year on January 22. The American Left Wing of the Northwestern Army, led by Brigadier General James Winchester, has struggled through the frozen wasteland of the Upper Maumee River in January to recapture the settlement of Frenchtown (modern day Monroe Michigan) from the British and Indians. He awaits reinforcements from the center and right columns, without fortifying the position. Lt. Colonel Henry Procter, commander of the British forces west of Lake Ontario and leader of the 41st Regiment of Foot, sees his only chance to strike the Americans before they could concentrate and overwhelm him. He marches as many men of the 41st, 1st and 2nd Essex militia Regiments to the vicinity and hides them in a ravine overnight. More than 400 Indian warriors led by Wyandotte chiefs Roundhead and Walk-in-the-Water join them. The Americans are warned by locals that things are afoot, but choose to ignore them. Instead those lucky enough to stay in the village huddle next to their fires and enjoy the first whiskey and civilized food they've had in months. The sun rises at 7 am. On the right, three companies of the 17th US Regiment of Infantry and one of the 19th are encamped, 200 yards distant from the rest of the army. Before dawn they are already roused, lining up for morning parade. The picket guard, groggy and stiff from a night of watching the perimeter several hundred yards north, realize that a large red coated group is approaching from the direction of Detroit. The American picket gets the first shot off, just as happened during the historical battle. They fire at the grenadier company, which is temporarily caught in the brambles of a woodlot. 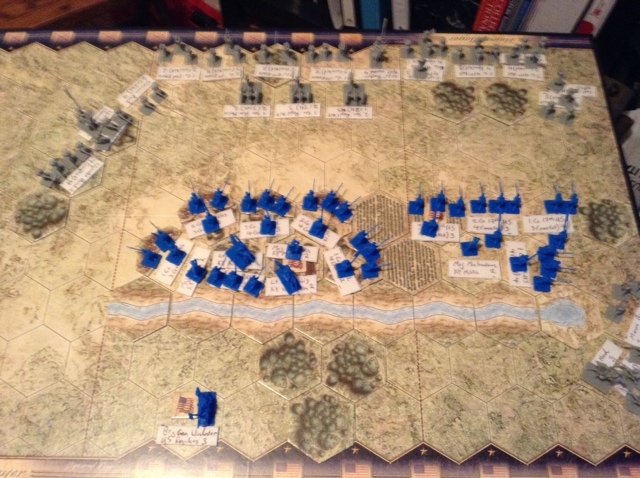 The shots momentarily distract the men, who are an elite flank company but still relatively inexperienced. On the American side, the musket shots alert the Kentuckians making breakfast in the village streets, as well as the professional soldiers lining up in front of their tents outside. It's too late. Roundhead has brought two groups of his warriors around the American right flank. They fire their muskets and hunting fusils into the ranks of a company of the 19th US. A few men sprawl on the ground, staining the snow crimson as their comrades stagger back towards the town. They leave the company to their north exposed. 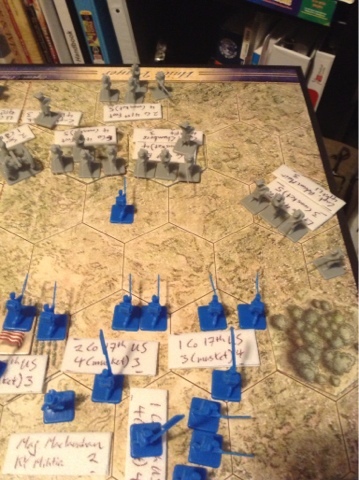 Colonel Procter has ordered a general advance, and volleys rip through the exposed American regular camp, sending the green recruits reeling in confusion and panic. The Indians on the flank, and the regular companies and 3-pounder cannons mounted on sleds in front create a storm of shot and small arms fire in the regular camp. However, in the early morning darkness, the Canadians and artillerymen send their fire thudding into what seems to be a mass of soldiers lined up outside town. It's the log wall of Frenchtown. The rounds smack harmlessly into the fenceline as the Kentuckians keep their heads down. 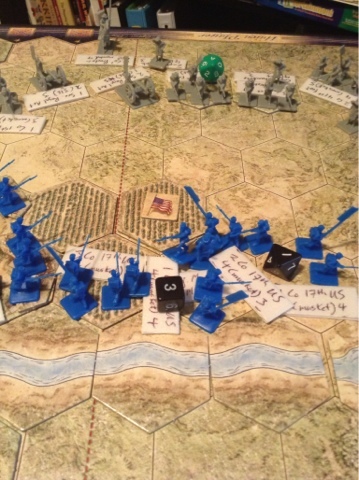 In response to the surprise attack that should have surprised no one, it is all the Americans can do to hold on in the right flank. On the left, the militia and volunteer riflemen line the safety of the fenceline and shoot back. They open up on the attackers in the center (who are themselves exposed) and send the Canadian militia running back to safety. The crews manning the sled mounted cannon stay fast--and die on their guns. The little howitzer section suffers enough casualties to knock one howitzer out of action. The little 3-pound round shot bounces off the fence, while the small 3-inch shells land and explode ineffectively in the streets behind the Kentucky position. 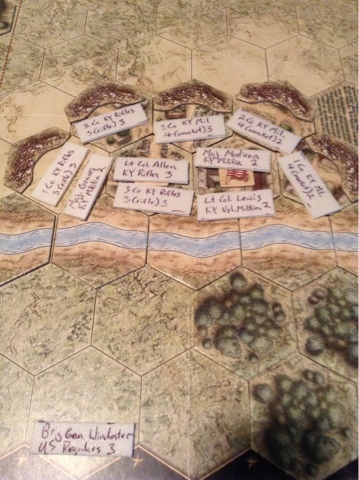 Safe in the town, Colonel William Allen sends a company of his riflemen out onto the icy river south of the town to guard the left flank and rear. They run into a Wyandot party heading south towards General Winchester's headquarters and pepper them with accurate fire. About half the warriors are killed, wounded or scattered and the rest fall back. Winchester himself, woken suddenly by the sound of cannon, musketry and fighting, throws a coat over his nightshirt and grabs a horse. He does not try to rally the regulars, heading into the safety of town instead. 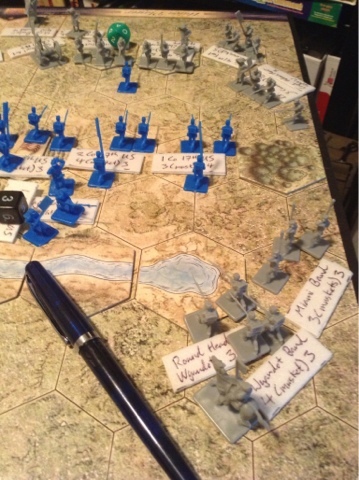 At 0715, the Americans are reeling but prepared to fight for their precarious position. Will the American position collapse and surrender, or can it hold out until reinforcements arrive up Hull's Road..? Can Procter finish the job before his men are shot to pieces and the other American forces move up to turn the tables on him?